NZFF • FSX: "STATIC OBJECTS LIBRARY"
Now the the "Snowman's FlightSim Addons" website is gone, both the FS9 and FSX Static Objects Library files are no longer available, and both were only available on the website, and nowhere else. This is not a problem for FS9, as i no longer build scenery for FS9. 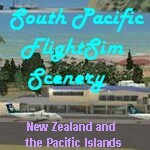 It is, however, a problem for some ( not all) of my FSX sceneries. My FS9 sceneries relied heavily on objects from this library, but not so my FSX ones, in fact some of my FSX sceneries use nothing at all from the SOL, using only included custom objects, objects from the free VLC libraries, and some default FSX SP2 objects. Following is a list of addon object sets that will cover all objects needed for my FSX sceneries done so far, that used objects from the SOL. These are all available from Avsim.com, with some also on Flightsim.com . The filenames may vary between the 2 sites. Create a folder in the FSX / Addon Scenery folder and name it " Static Objects Library ". Within that folder, create a " Scenery " folder and a " Texture " folder. Unzip the object sets to a temporary work folder of your choice. Move all files ending with the filename extensions .BGL or .MDL into the "Scenery" folder of the Static Objects Library. Move all files ending with the filename extension .BMP into the "Texture" folder of the Static Objects Library. You dont need any of the other files ending with . TXT or .XML unless you are using an object placing tool for building scenery. Start FSX, go to the settings, and the scenery library, and add the Static Objects Library just the same as you would any other addon scenery. Last edited by Snowman on Thu Feb 07, 2013 2:37 pm, edited 1 time in total. Re: FSX: "STATIC OBJECTS LIBRARY"
PM me as I have a file which should have all you need. thank you for your offer...i tried to pm you but it says, "The requested users to be added do not exist." Did you click on the blue cowpatz to send the PM? I will PM you. Often the black textures can appear if there are 2 textures with the same name. Thanks Steve..I got your file and all systems go! Any chance you could send me this file? I am unable to pm you both.